Dirge of Cerberus: Final Fantasy VII is a game that is a part of the 'Compilation of Final Fantasy VII', and is set three years after the events of Final Fantasy VII. The games storyline centres on Vincent Valentine with many cameos provided by the cast of Final Fantasy VII. The fragile peace enjoyed by the people of the world after the events of Advent Children is brought to a dramatic end when a mysterious enemy known as Deepground appears seemingly out of nowhere and many - including Vincent himself - find themselves targets of Deepground and their sinister plans. 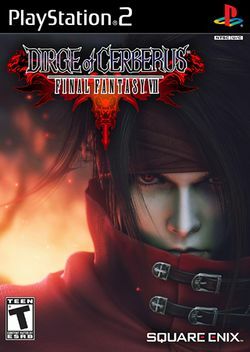 In a break from Final Fantasy tradition, Dirge of Cerberus is more styled as a Third Person Shooter than an RPG, although it does have many RPG elements, such as usable items and hit points. The director of Dirge of Cerberus said that he was a fan of the PC game Half-Life and wanted to turn it into an RPG, which he has done so in the form of Dirge of Cerberus. Vincent's running speed in the English language version is 1.2 times faster. Limit Breaks are no longer taken from the magic bar, a single-use item, the Limit Breaker is used instead with a set period of time until it runs out. Vincent can now do a double-jump and do ranged and melee attacks while in the air. Also, instead of having a roll-dodge move, he has a dash move. 'Easy Mode' was removed for the US release, and instead an 'Extra-Hard' mode was put in its place, only available after playing through the game once. Artwork, sound and character-model categories were included, unlockable through the new 'Extra Missions' section. Due to poor popularity and scarcity in the US and PAL territories, Online Multiplayer was removed and the game was made more single-player orientated, although some of the elements from the multiplayer were put into the main game and Extra Missions. However, this doesn't contain any of the extra storyline material available as it was presented in the Japanese online mode. The game has support for USB mouse and keyboard peripherals. This page was last edited on 22 October 2009, at 20:39.